An Indian Cultural Hub in central Dandenong is one step closer with the Andrews Labor Government announcing that a permanent location will be found as part of the ongoing development of Victoria’s first Indian Cultural Precinct. A Dandenong playgroup preparing children for kinder and school is among the winners of the 2018 Victorian Early Years Awards for their ‘Step Into Kinder’ program run out of Dandenong Primary School. 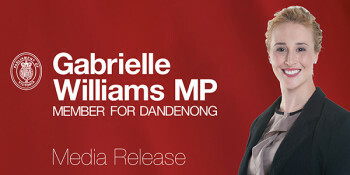 Manufacturers, precision component makers and food testing laboratories are just some of the businesses creating over 150 jobs in Dandenong, thanks to support from the Andrews Labor Government. Dandenong West Primary School is one of 93 schools across Victoria sharing in $15 million to build all-access play areas, sensory gardens and outdoor learning areas to support students with disabilities and additional needs, under the latest rounds of the Andrews Labor Government’s $30 million Inclusive Schools Fund. Chalcot Lodge Primary School is one of 93 schools across Victoria sharing in $15 million to build all-access play areas, sensory gardens and outdoor learning areas to support students with disabilities and additional needs, under the latest rounds of the Andrews Labor Government’s $30 million Inclusive Schools Fund. Lyndale students now have bigger, better classrooms and school facilities to learn in, thanks to the Andrews Government. Dandenong’s Greek Community will receive $150,000 from the Andrews Labor Government for an upgrade to the Dandenong Greek Community Hall. ﻿Launch Housing and Neami are set to receive more than $3.2 million in funding to help those experiencing homelessness in Dandenong. The latest round of Victorian Government grants to help reduce their energy costs is helping a improve the energy performance of a multistorey building in central Dandenong. The We Care Community Shed has secured vital funding through Pick My Project – the Andrews Labor Government’s ground-breaking program that gives locals the power to choose the projects their community needs.